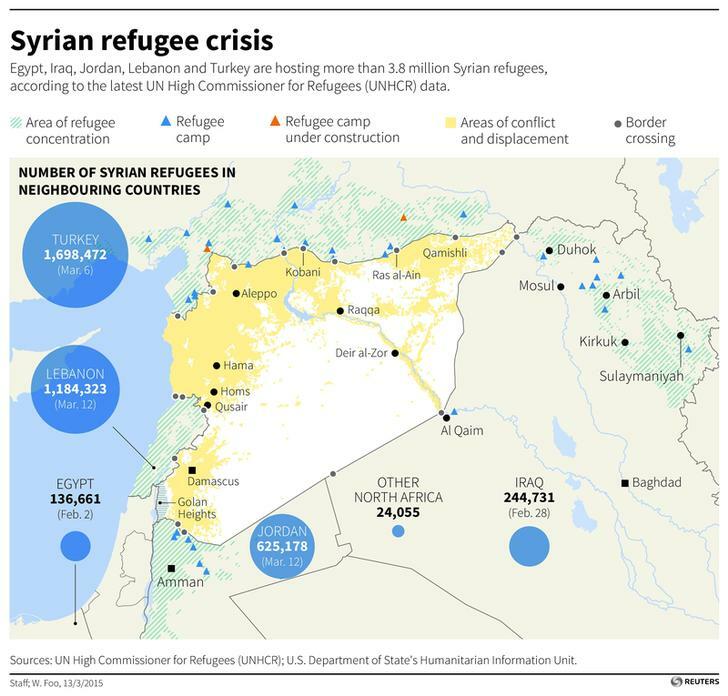 How can we rehouse the world’s refugees? Countries across Europe and states across the United States are debating the danger of admitting more refugees from Syria or, indeed, any majority Muslim country where Al Qaeda or Islamic State (ISIS) members or sympathizers could slip in with their families. This debate misses the point in two important ways. First, no evidence yet exists that any of the Paris attackers actually came from Syria as refugees. The Syrian passport found near the body of one attacker appears to have been stolen. The attackers that the police have identified grew up in Belgium or France. They are radicalized citizens, not fleeing foreigners. Second, the world now has 60 million refugees. That is a number roughly the size of six Belgiums, Hungarys, or Swedens. If they were to create their own country, it would be the size of France. In the face of such staggering numbers, commitments to take thousands or even tens of thousands of people will do almost nothing to alleviate the misery of millions. Rather than conflating the issues of refugees and terrorism, politicians and policymakers should be addressing each separately. On the question of refugees, Western countries should take in as many as their populations can assimilate, demonstrating a willingness to make good on the universal values they profess for both moral and political reasons. But the world also needs far bolder solutions than twentieth-century approaches like limited asylum quotas and “temporary” refugee camps. In particular, it is time to embrace the prospect not of camps but of cities – places where up to a million refugees of any particular nationality can live safely and learn how to build a better future. The National Democratic Institute has begun to reimagine refugee camps and camps for internally displaced persons as places where citizens can “find their voice” as voters and participants in democratic processes. Rather than remaining concentrations of desperate, dispossessed, and vulnerable people waiting for a day of return that may never come, refugee settlements should be fundamentally reconceived – as hubs of education, enterprise, and equal rights that can anchor networks of relatives and friends that extend back home and around the world. Individuals seeking refuge from a toxic and deadly environment could be welcomed not into camps, but rather proto-cities where the “global community,” represented by international institutions, NGOs, governments, and citizens, can encourage hope of a different, more secure life by nurturing positive seeds of knowledge, capital, and liberal self-government. Impossible? The Egyptian billionaire Naguib Sawaris is currently negotiating with the owners of two Greek islands a plan to resettle hundreds of thousands of refugees and put them to work building homes and infrastructure. If multi-millionaires already can buy an island as a vacation destination – through, for example, the website Private Islands Online – why not buy them as a destination for hundreds of thousands of displaced people who could then build the infrastructure necessary for a new life? And why shouldn’t international organizations do the same? Alternatively, neighboring countries could take the opportunity, with enough international assistance, to build cities that would be valuable centers of commerce and education for their own people. After all, China is pursuing precisely this strategy, building cities for millions of people to create nodes of economic and social activity across the countryside. This approach would enable all countries to be better prepared for and resilient to the continuing flows of millions of miserable and ultimately angry people. Today’s refugee camps are often breeding grounds for terrorism, revenge fantasies, and armed insurgency. By contrast, cities of stateless people under the protection of international organizations could provide their citizens with the tools for a better life. At the same time, we know far more about the radicalized Western citizens fighting for ISIS than most media reports suggest. New America, the think tank I head, has compiled a database on 466 individuals from 25 Western countries who have left their homes to go to Syria. Last week, researchers Peter Bergen, Courtney Schuster, and David Sterman released ISIS In The West: The New Faces of Extremism, in which a distinct profile of many of these individuals emerges. Perhaps most important, the majority are linked by family ties to other jihadists. Recent reports on Brussels’ Molenbeek municipality as a major incubator of ISIS and Al Qaeda supporters suggest that family and community ties are both important. “Hotspot mosques” have long been in the sights of counter-terrorist researchers and police task forces. Charting these families, mosques, and suburbs reveals networks that look just like disease maps, tracking the spread of a microbe as it travels along routes where it can infect others. Applying epidemiological techniques to finding, isolating, and disrupting the transmission of violence and the radical ideologies that breed it has already proved successful in the US context. For example, the organization Cure Violence works with urban gangs and treats violence “like an epidemic,” preventing it by “stopping it at its source.” The ideological source of jihadist terrorism may ultimately be in Syria, Iraq, Afghanistan, or Mali, but the source of foot soldiers in the West is communities containing radically alienated youth. Frightened populations can all too easily summon images of radical refugees slipping across borders intent on wreaking mayhem. The realities for both refugees and terrorists are considerably more complicated. Fortunately, taking the time to study the facts in both cases can yield promising new paths to longer-term solutions that balance security and humanity. Author: Anne-Marie Slaughter is President and CEO of the think tank New America. Image: A refugee woman washes dishes at a refugee camp. REUTERS/Umit Bektas.